This page last revised July 8, 2015. 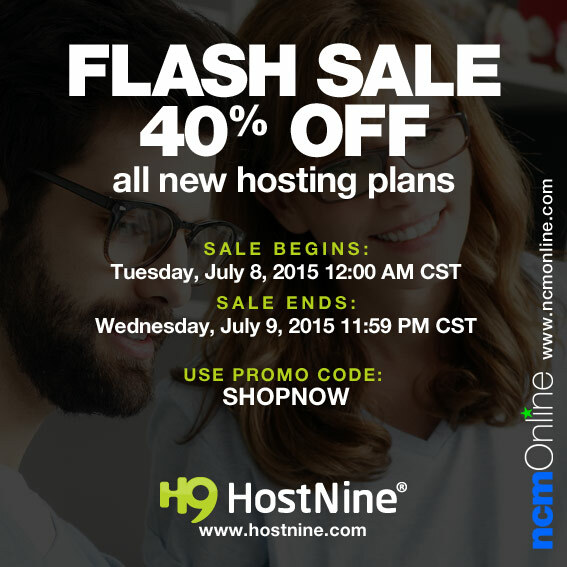 Get 40% off any new HostNine web hosting plan. This sale lasts only 48 hours. Use promo coupon code SHOPNOW. Expires 7/9/15 at 11:59 PM CST. Offer applies to new hosting orders only. Not valid for renewals, domain registrations, or “add-on” services. Discounted services renew at the regular rate. You may use the link immediately below to contact HostNine directly for definitive offer details including expiration date, exemptions, and valid applications of discount. Certain elements of this page: ©2015 Hostnine LLC, All Rights Reserved.